The HRV 120 Globe is a compact pellet boiler stove suitable for heating radiators, hot water and underfloor heating systems. The pellet stove boiler can be installed in conjunction with an existing heating system or as a standalone unit. Thanks to the adjustable power settings the HRV120 Globe is ideal for heating small to medium sized homes up to 370mt3. The stove’s large 23Kg internal hopper ensures it can run for long periods without refilling; up to 23 hours from just one fill of pellets. Cleaning is simplified thanks to a self-cleaning grate which empties automatically into the ash pan. The boiler stove is fully automatic, similar to gas or oil boilers. The built in seven day programmer is fully adjustable in terms of time and temperature, so your home will always be warm at your desired time. This pellet boiler stove works just as well as a modern gas or oil central heating boiler, but with enjoyment of a flame. 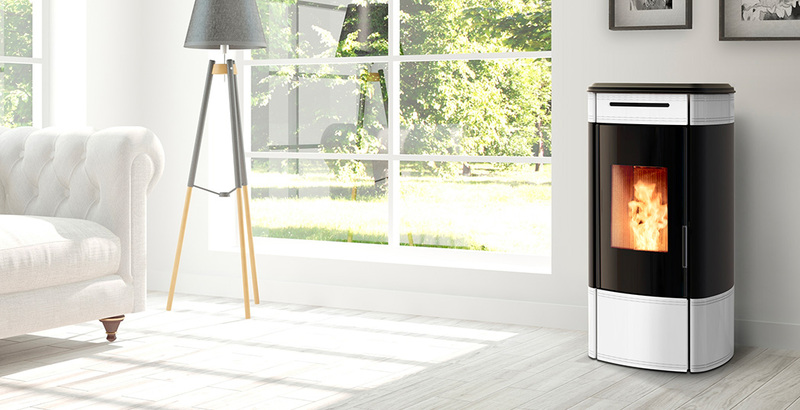 Ravelli stoves feature a 'Silent system; this system ensures that the noise levels are greatly reduced, making Ravelli pellet stoves among the quietest on the market. The HRV140 Globe pellet boiler stove is available in three colours and comes standard with RDS system, touch remote control. Ravelli stoves feature a 'Silence system’. This system ensures that the noise is greatly reduced. This makes our stoves among the quietest on the market. The new built-in RDS system automatically ensures that combustion of your stove is optimal. One advantage is increased efficiency meaning more heat for less pellets. In addition, the RDS senses when the fire pot is getting dirty and increases the fan speed to clean allowing the stove to operate for longer intervals.